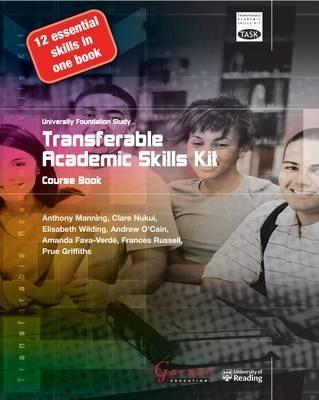 Transferable Academic Skills Kit: Combined Course Book Transferable Academic Skills Kit is a flexible learning resource that has been carefully designed to develop the key transferable skills that promote students' success in university and college study. Whether you are a student of an instructor, TASK provides a tried and tested teaching and learning tool suitable for a broad range of academic disciplines. A series of supported exercises relates theory to practice and provides students with the tools to develop a framework of skills that can then be used in a wide range of contexts both inside and outside the academic world. TASK can be followed as a complete program of study, or individual modules can be selected to address specific needs. Created by members of the academic staff at the University of Reading, TASK forms a part of the university's skills provision for home and international students at all levels. Amanda Fava-Verde began her teaching career in France, where she specialized in Business English for professionals. She is currently Course Tutor for the University of Reading International Foundation Programme, where she teaches English and Academic Skills. Her area of expertise is English for Academic Purposes and her research interests relate specifically to Second Language Academic Writing and Online Language Learning. Amanda has a keen interest in academic acculturation and is conducting longitudinal research tracking the progress of international students through to graduation. An e-learning enthusiast, she is an active member of Webheads-in-Action - an online community of practice of language teachers worldwide. She holds an MA in English Language Teaching from the University of Reading, the Diploma in TESOL from Trinity College, London, and the Online Education and Training Certificate from the Institute of Education (London). Amanda co-authored two of the TASK (Transferable Academic Skills Kit) modules: Essay Writing and Problem Solving. Prue Griffiths co-authored the Scientific Writing module in Garnet Education's TASK (Transferable Academic Skills Kit) series. She joined the School of Biological Sciences at the University of Reading in 1986 and since then has taught at undergraduate and postgraduate level and taken an active role in teaching and developing the University's International and home Foundation Programmes. She also teaches Academic Skills and acts as a Personal Tutor. In addition to her lectureship in the School of Biological Sciences, she holds a lectureship in the School of Human and Social Sciences, teaching Environmental Science. She was a lecturer in Biology, Ecology and Physical Science with the University of Maryland between 1986 and 1991 and has also taught in Further Education colleges. She has worked as a reviewer and editor for Macmillan and Garnet Education and as an A level examiner with the University of London Examining Board. Prue is also a member of the Institute of Biology and the Freshwater Biological Association and she holds a BSc (Hons) in Biological Sciences, along with a PhD and a PGCE. Dr Anthony Manning is Dean for Internationalisation at the University of Kent and was formerly Director of the Centre for English and World Languages. Anthony is one of the original creators of the TASK (Transferable Academic Skills Kit) series and he remains one of the main authors of the second edition of this range of books. Also for Garnet, Anthony has written Assessing EAP and English for Language and Linguistics as part of the ESAP series. Anthony has written a number of other books and journal contributions for other publishers. Before joining the University of Kent, Anthony was Assistant Director to what is now the International Study and Language Institute at the University of Reading. Anthony also taught in France, Germany, China and Japan. He has also been a lecturer at a Japanese College situated within the University of Durham, and at an International College in Reading. Anthony has a Doctorate in Education and Applied Linguistics with a focus on language testing. He has delivered seminar papers at ALTE, IATEFL, InForm and BALEAP conferences on the subject of English for academic purposes, language assessment and academic skills development. Clare Nukui is Programme Director of the International Foundation Programme (IFP) at the University of Reading. She teaches EAP and Academic skills and is also responsible for the pastoral welfare of the students on the IFP. Clare is the author of four books in the Garnet Education TASK (Transferable Academic Skills Kit) series. She has also written materials for BBC English and book reviews for its corresponding magazine. She is a member of the editorial committee of InForm, a new journal for IFP professionals. She has delivered workshops and seminar papers on working with Japanese students and academic skills development at foundation level at IATEFL and has also lectured at the British Council, Tokyo on the History of English as a Global Language. Before joining the University of Reading, Clare taught in Nigeria, Hong Kong and Canada. She was also an EFL teacher at the Swan School, Oxford and a lecturer at an International College in Reading. Clare's research interests include the teaching of Critical Thinking, Plagiarism and Intercultural Communication. She has MAs in Applied Linguistics and Social Anthropology which have helped bring together her diverse interests. Elisabeth Wilding is Deputy Head of the International Study and Language Institute at the University of Reading. She is a member of the editorial committee of InForm, the journal for IFP professionals. Elisabeth's teaching and research interests relate to technology-enhanced learning, MOOCs, and academic skills development. Elisabeth has co-authored two course books in the 2015 TASK (Transferable Academic Skills Kit) series: Presentations and Research and Online Sources.